Off to a great start with a sunny Friday evening at the Moot Hall. Tom and Astrid Gibbs, Sally Ozanne and Aitch Carter were ready to run, and support crew Mum, Dad, Lucy Harris, Rosie Fuller, Al Bruce were ready with cameras and cheering. Ian Mulvey and Emily who I’ve been forcing on plenty of long recces during Feb and March (eg 9 hours in the snow!) also came to see me off, plus Daz the Slug from the FRA Forum with his support crew, as he was setting off 15mins afterwards. James Thurlow (www.howfast.org and www.openadventure.com) had very kindly lent me a tracker so I had already got plenty of excited facebook messages from people glued to their computers all over the country. Really enjoyed this first leg, gaining 17mins on the schedule due to fast descents down Skiddaw, Great Calva and Blencathra with Tom and Astrid, with a smashing skyfull of red sunset behind. Sally even got chance to interview me for a change with her iPhone! Caused my support team some angst by flying straight through transition at Threlkeld, past Mum holding a thermos of hot tea and Rosie displaying a tempting array of pizza and turning left down the wrong side-road! If I was going to make it round within 24hours I was going to need to play to my strengths: downhills, rough terrain, not stopping and a crack support team of elite adventure racing navigators! After a 5sec detour down that wrong side road I was back on track, crossing the A66 and along the road leading to Clough Head in the dark. I knew my super-fast support team would catch me as soon as I hit the next uphill. Sure enough, Nic Barber was handing me my torch, followed by Alex Pilkington giving me a drink, then Sally Ozanne, Kim Collison and Ali Love caught us on the rapidly steepening flanks of Clough Head – the first wall of grass. Alex very kindly lent me his headtorch as mine was doing a weird flashing thing that was annoying me! And looked after me, tying an extra layer around my waist as he knew I’d need it as soon as we reached the top. He was so right. The weather was rapidly deteriorating, so waterproofs were on at the summit, and soon after, waterproof trousers as we ticked off Great Dodd, Watson Dodd, Stybarrow Dodd and Raise. The fog was right down, the rain fell in fat droplets and the wind slammed it into our faces, but it was no match for my absolutely brilliant navigators. My tactic was driving uphills with poles, then flinging them into the hands of the nearest person, usually poor Kim, so I could let loose on the downs. Getting rockier underfoot, White Side and Helvellyn Lower Man fell next, then one of my fave mountains to get myself lost on, Helvellyn, but this time I had my secret elite athlete weapons leading me confidently all the way to Nethermost Pike and Dollywaggon Pike as if it was broad daylight. Amazing! Some waterproof trouser-ripping bum sliding then got me to Grisedale Tarn in double quick time, where Sally and Ali nipped off to Dunmail to get my food order ready (soup with pasta in, an apple, and grey socks, well done for remembering gals!). It was so, so windy, my ripped waterproof trousers turned into a sail, so heroic Nic lent me his, on the proviso that there’d be no bum-sliding in them! Umm…I’ll get him a new pair… Then Fairfield was, to put it mildly, a right freakin’ slog up what seemed like vertical scree in pitch black with high winds, driving rain and fog, and I was getting cold even on the climb. There was an exciting, wind-blown “Congrats! Keep going!” to Daz the Slug and team as we shot back down, which spurred me on up Seat Sandal. Alex kept shoving bite-sized edibles into my mouth, and Kim kept just behind me, staying with me while Nic went on ahead navigating. I couldn’t wait to get to Dunmail Raise, and Nic ran down with an updated set of needs – a warm car and complete change of clothes, I was completely soaked and freezing cold. There was a quick slither down Seat Sandal into a rain-blurred cluster of bobbing head torches at Dunmail Raise. I felt very rude just leaping straight into the warm car without stopping to talk to my amazing 3am support crew. My poor mum was trying to get me to eat the soup I’d ordered but all I wanted to do was get my soaking clothes off and fight to get my thermal leggings over clammy legs. She managed to get a few chunks of apple in me, but I couldn’t face the massively cheese-pimped pizza me and my AR partner Sara usually devour with glee in races. I took 18mins to get changed and finally slurp down the soup, but was still 10mins up on schedule here. This was soon to change with some pretty horrendous rain, fog, slippery rocks and general knackeredness! When Steve Birkinshaw, winner of the Dragon’s Back Race, local resident and top banana navigator has to check his location twice with a GPS you know the clag is down! It was like scuba diving through a car wash. There is no way I could have got myself round Steel Fell, Calf Crag, Sergeant Man, High Raise and Thunacar Knott without his expert skills, and without Lucy Harris and Helen Jackson who insisted on feeding me constantly and providing much-needed motivational and happy chit chat through the witching hour. Surprisingly, eating was by far and above the absolute worst thing about this round, which is very surprising given the ease with which I devour almost anything when stationary. I felt slightly sick from leg 2 onwards, best explained as an underlying bleurgh. At some point it got light enough not to need headtorches, but we couldn’t really tell because the viz was only 50-100m. By now the consistent battle with the weather was taking its toll. I was becoming even slower uphill. By Harrison Stickle I was 19mins down on schedule, and losing time on each successive summit: Pike O’Stickle, Rossett Crag, Bow Fell, Esk Pike and Ill Crag. The rocks were so slippy I couldn’t now play to my strengths of fast downhills and quickness over rough terrain. My legs didn’t even hurt too much at this stage so it was definitely very frustrating not to be able to speed up and claw back the vital minute or two on each descent that I so needed. By Broad Crag I was an hour behind, and when we finally got to Scafell Pike we met poor Craig Dring, who had waited an extra hour in howling weather at Broad Stand to hoik me up before walking the route anti-clockwise to see if he could find us. He said he could set it up again, but I was cold, the rain and wind were still lashing down so we decided that keeping moving was the best option and Lords Raked it up to Scafell. Some bum/top of thigh chafing had started somewhere on this leg due to being constantly rained on, but I was too cold to feel it yet… Happily, the descent from Scafell was flippin’ amazing, with an excellent scree shoot to ski down and some magnificent bum sliding (sorry Nic – I was still wearing his trousers) with one section so steep we nearly lost Stevie B! All brilliant for tiring thigh muscles and massively motivating to claw 3mins back from my 1hour 22min time loss. Rapidly descending from the clag and cold, I warmed up, dried out quickly and shot through Wasdale past a colourfully-jacketed, massively motivating and excited support team without stopping to save the 15mins stopping time with the crazy thought of desperately trying to get the hour back on leg 4. Here I leaned that Daz the Slug had had to bail at High Raise due to atrocious weather conditions, cold and cramp (what a sensible plan! 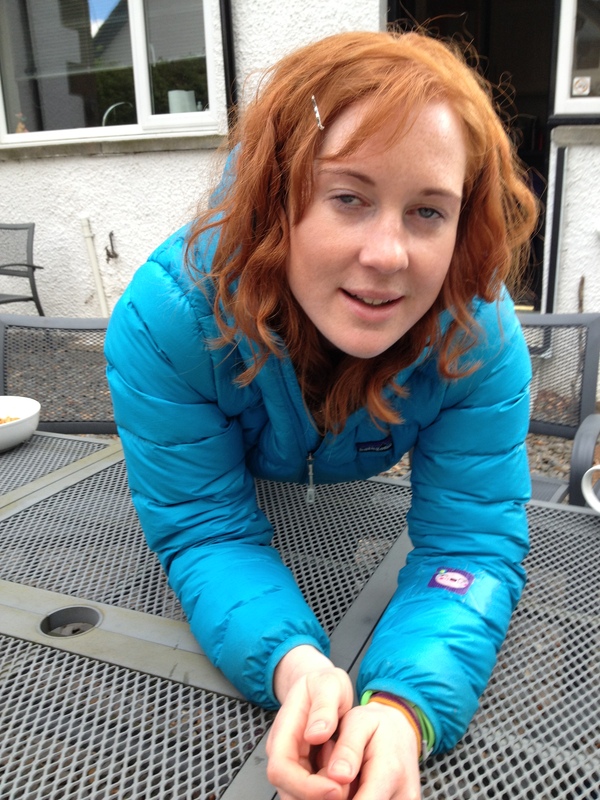 ), so his support team had left me banana cake and custard and were following my progress on the tracker instead! This, along with the daylight, intermittent dry spells and the knowledge that somewhere around Pillar I’d meet John Telfer on his anti-clockwise round, was massively happy-making. 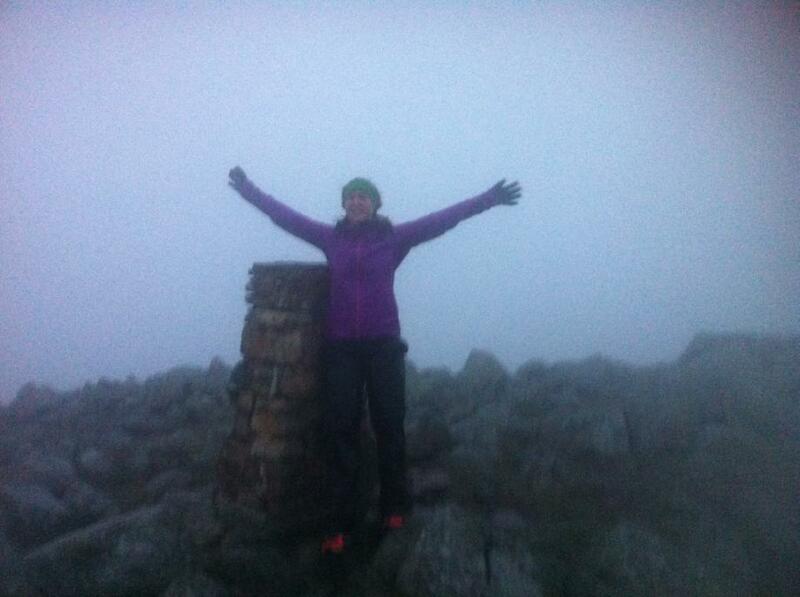 Suddenly it hit me at Great Gable that the 24hour dream was over. I had 3hours 10mins before the cut off and I wasn’t even on the summit yet. 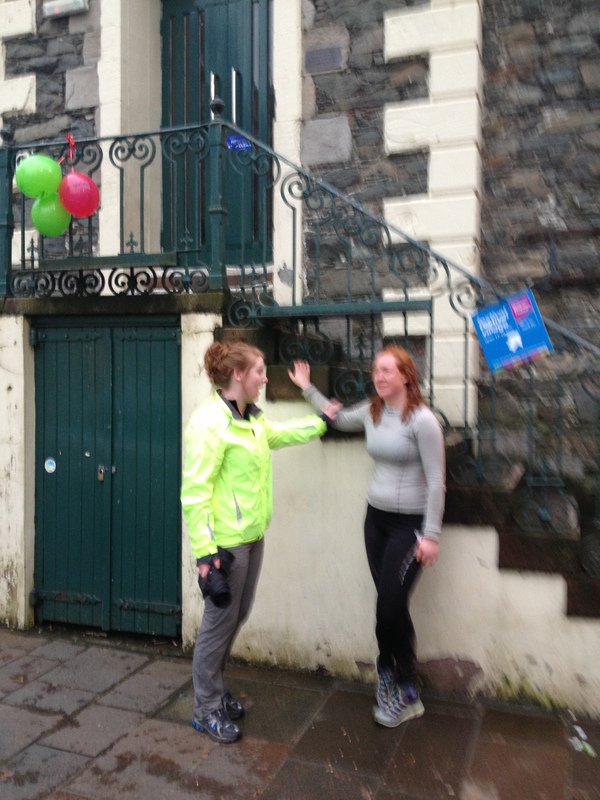 It felt pretty demoralising, but the worst thing was I knew I would carry on – so the pain would only be prolonged! Without a time schedule to claw back, I took it easy for a bit around Great Gable, getting a bit narked when we missed a trod and had to scramble across a load of rocks a couple of times. I confessed to my supporters that I felt like I’d failed because I wasn’t going to make it in the 24hour time frame, but they all cheered me up massively by saying that I’d done really well in the weather conditions and just to complete a BG was beyond most people. I felt a lot better after that, because they were right. 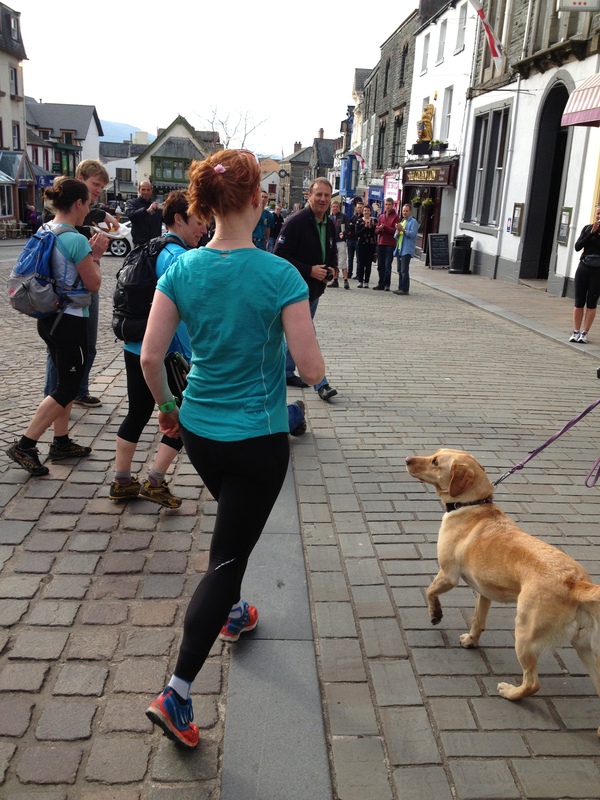 The Bob Graham Round is an amazing achievement in itself. 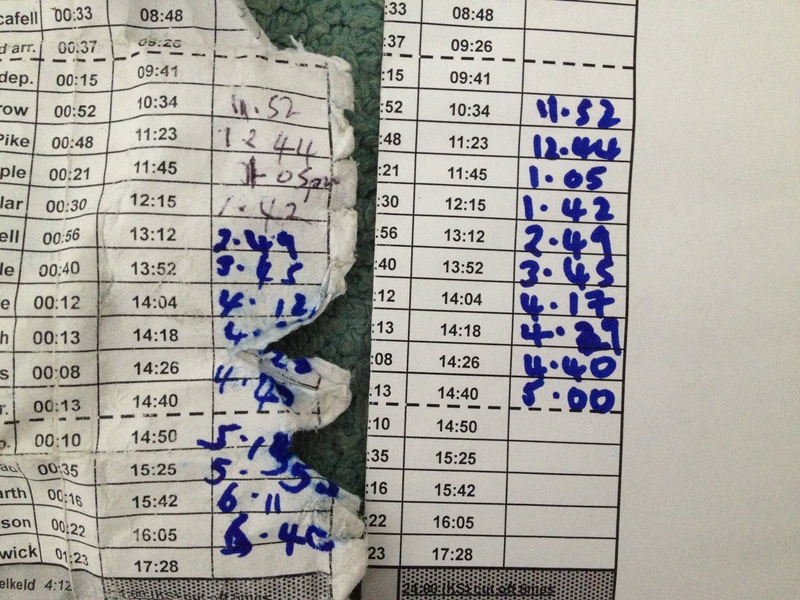 I had never run more than 12 hours (40miles) in one go before, and last Jan 2012 the furthest I’d ever run was 15miles. And here I was 21 hours into one of the toughest fell running challenges in the world, berating myself for not being fitter and therefore faster up hills. So I focused on just getting to Honister and actually sitting in an actual chair for once and let my amazing support team shovel some proper food into me, change my disgusting socks and tell me I was totes amaze balls. This thought made Green Gable, Brandreth and Grey Knotts go slightly quicker, and the sight of my sister Booch (Becca) running towards me through the Honister car park to hobble me into transition made me well up! She had driven up on the Saturday morning so it was the first time I’d seen her, and I knew it would be massively motivational as when she supported me on the 38mile Tour de Helvellyn last December chatting to her really got me through that dark night running with me down the road from the final checkpoint at Martindale Church. “Yes.” Of course! You can’t get all that way and stop because of a little bit of thigh burn and chaffage. Once you’ve been on the go for 23hours, what’s the harm in 3 more? I was happy to see some more new faces on this leg, Kerry Pilkington, Nicky Butler and Rosie Fuller all took turns on placing their hand on my back up the hills to make me move faster. They swear I did all the work and they were just encouraging me, but if I ever do go for the proper 24hours I’d definitely need to do it without helping hands, however lovely it was! Sabs and Ben also came on this leg to carry on the motivation, and Lucy (with one hour’s sleep after her immense leg 3 graveyard shift) happily joined us to ensure we got the right bum slide off of final summit Robinson. 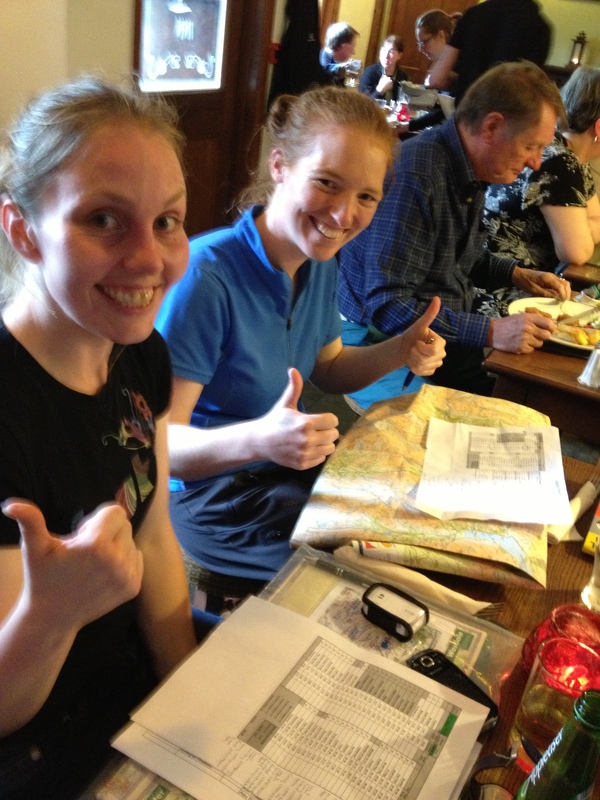 Sabs and Lucy were very keen that I keep to the original schedule splits for this final section, which involved more pain, but was actually brilliant because it gave me something new to focus on and a feeling of being really proud of my efforts on the last leg. We reached the 24hour cut off at Dale Head, and descending, I realised it doesn’t really hurt that much more whether you leg it or go cautiously, in fact if you go slower it just prolongs the pain, so I whizzed down the hills very impressively and was soon round to Hindscarth. By now I’d well got the hang of just flinging my poles down when I didn’t want to use them on the descents, so my new support team had a giggle about the BG being the only time you can behave like a 5year old when I flung my poles down, stripped my windproof off, dropped it and demanded banana! At Hindscarth Ben Walker and Pete Robinson suddenly appeared out of the mist and Pete decided to video and chat to me looking my absolute worst in the world! So now I know how it feels! Sorry everyone I interview during/after races! At this point I was also becoming very painfully aware of my bum/upper thigh chaffing (I know, hideous, you didn’t want to know that), but I didn’t have any Vaseline, so I had to dig into a chapstick instead…Nicky says she’ll never look at them in the same light again! Pete didn’t video that bit, but he had the camera on forever on the final ascent up Robinson so as well as making a humungous effort I also had to hold my stomach in! This was soon forgotten when Ben handed me some amazing chocolatey marshmellowy tiffin type stuff, and I legged it down the ridge, climbing carefully down two slippery scrambles and very much enjoying the final bum slide to the valley floor and soft grassy path (with inquisitive/mental black horse running at us!) to the road where I knew my Dad would be waiting on his bike for the final run in. I was semi-dreading this final hour on the road, and secretly a little bit glad that I was 2.5hours over because it meant not being beasted on it! Al was there with Dad, and they changed me into dry socks and slipped my feet into super-cushioned trainers which saved my knees from the impact of the road. I ran as best I could, just wanting to get there now, and taking the racing line down the road at each curve, Dad high-vizing the way ahead on his bike and making cars slow down – by now I was of the attitude that they should get out of my way, I’ve just run 65miles! One beeped his annoyance at me. Knob head! After ages on the road, and a quick poo stop (again, you probably didn’t want to know this, I’d never normally poo by the side of a road in front of my Dad and a full cast of supporters, including one with a video camera but I was past caring! And I think you should know what this beast of a round is really like, warts and all) we were at Portinscale and Booch was there to run me in! Yessss! It was the last 10minutes!!! I was getting all serious now because I just blimin’ well wanted to get there. Booch tried to point me round a puddle, I splashed straight through it; walkers were in front of me, I grunted to Booch to make them move! We even stopped a car mid-swing around the mini-roundabout by Booths! 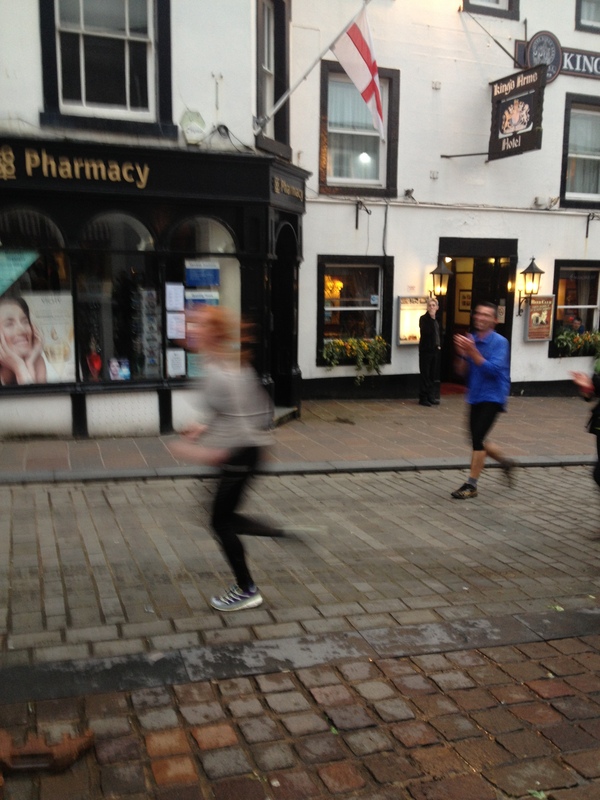 As we raced up Keswick high street Booch started yelling out to everyone in the street “My sister has just run 66miles!!! !” like a zillion times – she would never normally shout at people in the street unless drunk, which fully amused me. And then all of a sudden the Moot Hall was in full view, with a massive crowd of people all clapping and cheering, even though half of them had just come out of pubs and didn’t know why the hell this dishevelled, sweaty girl was thumping towards the Moot Hall with a look of intense pain and joy on her face. It was all surprisingly emotional and I let out a few little yelps of cry – not just because I could finally just friggin’ stop friggin’ running but because everyone was there cheering! Randoms from pubs, my truly amazing support team, and Daz the Slug’s support team who had now adopted me. Mum put a congratulations banner around me, Dad handed me a bottle of champagne, balloons were bobbing around, people were clapping and for a 5 whole minutes I knew what it was like to be an elite athlete and win a race. My own race, so I had to come first – cunning, see? CM blurs into the finish! 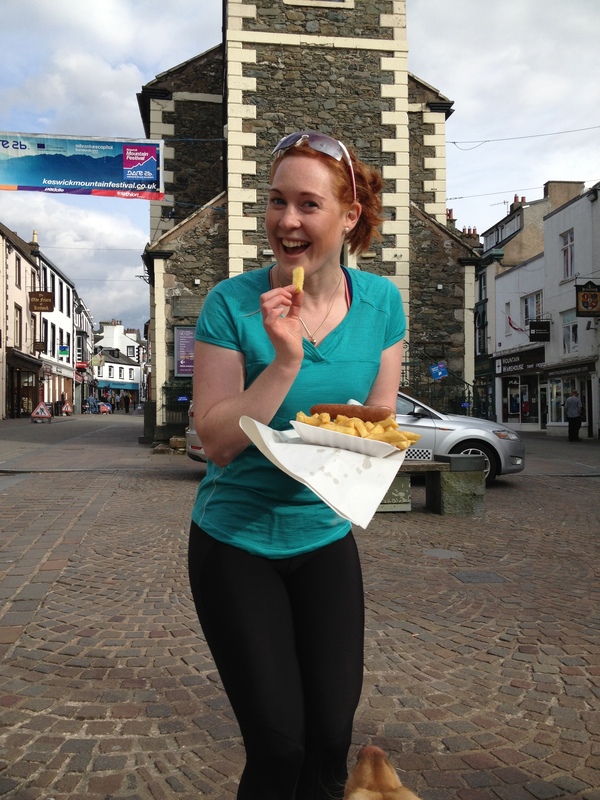 Then reality kicked back in and for some reason, even though I’d stormed something like an 8min mile into town, my legs now refused to function, but I did manage a whole paper cup of champagne and five delicious chips before being supported to the car. I think I must have given it my all because after a hot shower I felt really really sick and lay on the floor in a towel groaning like an idiot while my sister tried to dry my hair and stop me getting cold. Mum came in and made me sit up, at which point Wil’s formerly delicious potato and corned-beef mash made another appearance and I puked for a couple of minutes in the bath. Thanks body! I was pretty much falling asleep at this point, getting too hot, then shivering with cold, the chafing was burning every time I moved and my hip sockets felt like someone was sticking a hot poker in them. They made me drink electrolyte drink and a cup of tea before putting me to bed, where I zonked out at about 10:30pm. Sadly this meant I missed my own post-BG celebratory party!!!! When do I ever miss a party???? This was very sad, but I was asleep so I didn’t mind at the time, and all my supporters got a good giggle over the photos and videos and ate delicious baked potatoes. 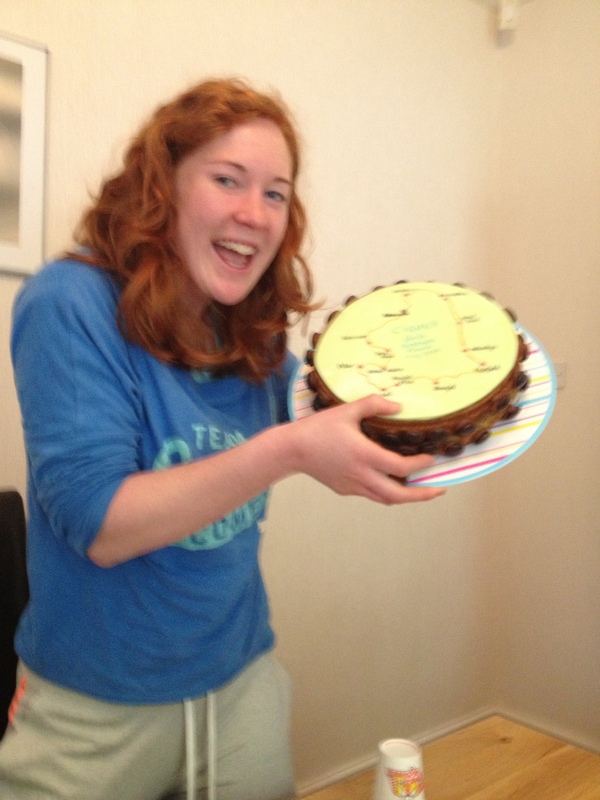 The next morning I came down to an amazing BG map cake that Mum had made! And the most delicious cooked breakfast in the world. If someone could put these both in an energy bar I would buy them immediately. Real food. At last. And 19 text messages and a similar number on facebook all saying congrats! I had a huge following due to the tracker, my phone was binging all the time with go for it messages, colleagues were sharing the link, family friends were emailing support, and someone said there’s a nice thread on the FRA Forum since Daz’s support crew adopted me. It was absolutely brilliant that so many people were egging me on and congratulating me on the hardest and maddest athletic thing I have ever done in my life. The next day I was surprisingly okay and managed not only to get down the stairs but also to walk the couple of miles to the Keswick Mountain Festival to see Kim and Charlie Sharpe finish 3rd and 4th in Ian and Emily’s Scafell Trail Marathon, and well done to Ricky Lightfoot too who came first but did it so fiendishly quick I didn’t see him. Mum bought me a lovely massage with Paul Quine from Atlas Physiotherapy at their demo tent, and now I am left with, in order of painfulness: a very chafed upper thigh area; sore, slow-moving quads; 2 heel blisters; moderately painful calves; aching biceps from the pole action; 3 between the toe blisters; a stitch on the right when I walk and strangely swollen hands. Not lost any toe nails yet, and the lack of sleep didn’t feel too bad. The main thing I’d advise take snacks that slide down easy – banana, porridge, mashed potato and corned beef, grapes, isogels, shot bloks, anything slippery! And just keep going, even if you’re not on time. Andy Brook-Dobson did his BG in even worse weather conditions the week before in 26hours 42mins, and both of us think we could have achieved it in the golden 24hour time frame if the weather had been perfect. But I’m also somehow even more proud of completing in 26 hours 36mins in ‘orrible clag and rain because that also means I am officially nails. Or mad. Probably both. 40:60. Either way, I did it. I’ll enjoy telling stories starting, “When I did my Bob Graham…” and I’m not going to run next week. 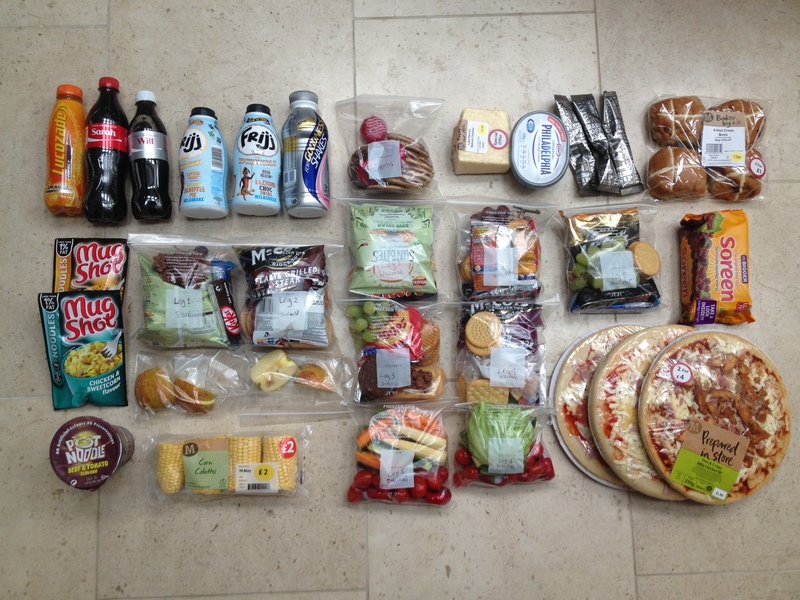 And I’m going to eat whatever the hell I like. So it’s thanks to my more than brilliant support team who I could never have done a crazy-arsed thing like this without, and to you, thanks for reading. If you want any advice from me, I’m very happy to share my new found experience with you to help you on your way. Keep going. Whatever your challenge is, you can do it. Previous Previous post: What else can you do in Costa Rica?